Pet Portraits | Pet Oil Paintings Like You've Never Seen! Pet paintings! Get your pet paintings! Step right up for a chance to commission your very own Splendid Beast. 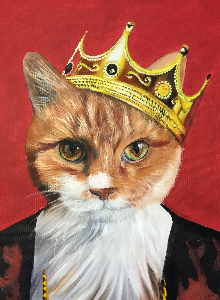 Immortalize your beloved creature with a custom oil pet portrait on canvas. A work for the ages. Astound your friends and infuriate your enemies. Or a completely original masterpiece! Intriguing! How does it work? Tell me more about custom work! I want to see more backgrounds! Have a perfect photo of your pet? We can reproduce it as an oil painting, exactly as is! I have a splendid photo. Let's do this! Feline lovers would do well to peruse our gallery of cat paintings for inspiration. 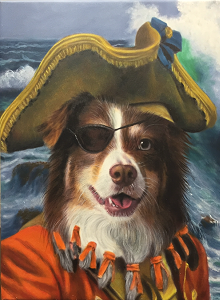 If you intend to become a patron to man’s best friend, be sure to visit our esteemed gallery of dog paintings. Looking for a truly massive work of animal art? You’ll want to consider the huge canvas option. Just want to see the best recent work? Check out our top paintings from 2017 and from 2018. As LeVar Burton used to say, "But you don't have to take my word for it." See what previous customers say about their Splendid Beast pet paintings and how their beasts have been ennobled. In the video below, Beth unboxes the painting she commissioned of her airedale Geoffrey (@geoffreytheairedale)! You can see more in our blog post about some of our Splendid Owners.